The bouncer my babies used was the old-style wire and crochet variety – at the time there was not much else available. The fanciest bouncer on the market had a battery operated ‘jiggle’ movement but babies looked like they were vibrating on one of those terrible ‘massage beds’ found in cheap hotels in the seventies. Fast forward eight years and parents are spoilt for choice when it comes to bouncers but perhaps none are quite as exciting as the brand new Mamaroo. The Mamaroo marries style and function. Lots of bouncers look great but don’t have any bells and whistles or they have loads of features but look like a big, clunky toy. Not so with the Mamaroo – its design is fantastically futuristic and its sleek seat cover (easily removable and machine washable) is available in six colour combinations. Note the absence of many dangly toys – instead there are three simple plush toy balls decorated in the style of Van Gogh, Monet and Seurat that pop in and out of the unobtrusive mobile so babies can chew (or study) them. Lastly, the Mamaroo features five built-in nature sounds plus has an outlet for your MP3 player. I’m sure most babies love the sounds of ocean waves or rainforest birds but mine also really liked the Bee Gees (I took the fact that they weren’t crying when I played the Bee Gees as a sign that yes indeed, they liked them as much as I do). Brilliant! 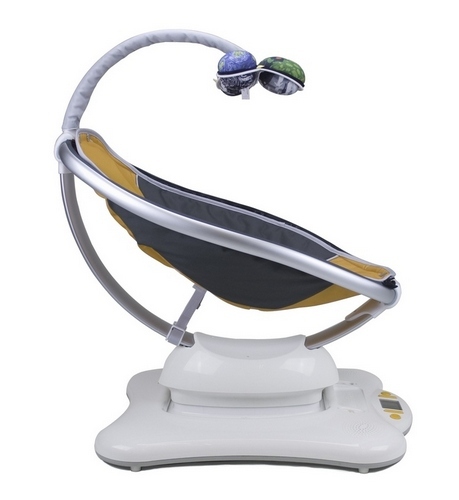 The Mamaroo is US$199.99 from Modern Nursery who will ship to Australia by arrangement.